About 40 religious leaders, women, and youth participated in this interfaith dialogue which was held in the Lagos State University College of Medicine, Laos. Participants in this meeting discussed to seek for the commonality across religious scriptures in the hopes of defining true peace. In reply to the question, “As a religious leader, what is the definition of peace in your religion?” each religious representative presented his views on effective ways to build world peace. After the presentation, Rt. Rev’d J. Adedayo Ojaoba J, a bishop of Diocese of Lagos Island United African Methodist Church and one of the members of the audience, explained the significance of this meeting. “Comparing scriptures will go a long way in resolving religious crisis if it is taken seriously by leaders and subjects and if it is let known to the people how important peace is to their religion.” Instead of holding on to prejudices and indifference, the presenters and the audience shared an ambience of acceptance, a genuine curiosity toward one another’s perspectives, and the thirst for insight. Notably, Imam Abdullahi Shuaib, an executive director of Zakat and Sadaqat Foundation and also the guest speaker of the event, commented, “I can confirm to you that the conference was a huge success. All the participants willingly signed the peace agreement and strongly desired to meet regularly.” By signing the peace agreement, all the participants pledged to continue to work together to bring world peace. 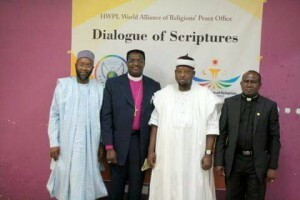 Convening this World Alliance of Religions’ Peace Office meeting holds a special meaning for the country of Nigeria. For a long time, Nigeria has been constantly surrounded by imposed violence and religious conflicts. As noted in the names of many Nigerians such as “Olufemi,” which means “God loves me,” Nigerians have always been eager to search for answers in alleviating violence caused by religions. Interfaith dialogue through WARP Office meetings only marks the beginning of building peaceful coexistence on behalf of every Nigerian’s wish. Interfaith dialogue through HWPL World Alliance of Religions’ Peace Office (HWPL WARP Offices) is not only limited to the country of Nigeria. Currently, many World Alliance of Religions’ Peace offices are being established and are actively operating around the world. The offices began as a continuation of the signing of the Peace Agreement by the religious leaders at the WARP Summit in September 2014 in South Korea. Chairman Man Hee Lee of HWPL and Chairwoman of the International Women’s Peace Group (IWPG) invited religious leaders from around the world to the WARP Summit. Out of all participants, about 1,000 religious leaders attended the Summit and signed the peace agreement. After returning to their home countries, these religious leaders have been making their best efforts to carry out the promise they had made at the summit by establishing and operating World Alliance of Religions’ Peace Offices in their respective countries with the help of HWPL officers. HWPL not only hosts interfaith dialogues for religious leaders through the HWPL WARP Office meetings, but also campaigns to enact an international law for the cessation of wars. Chairman Man Hee Lee, a Korean war veteran, experienced the atrocities of war and witnessed the deaths of his fellow soldiers in the battlefields. Since then, he has been dedicating his entire life to bring world peace. His dedication resulted in HWPL’s unparalleled peace activities that are now regarded as effective solutions to world peace and cessation of wars.